Vivian Mauro plans to take a group of Buffalo area residents to Brazil in the spring of 2012. The destination is the spiritual healing center Casa de Dom Inacio (The House of St. Ignatius of Loyola). Clarence, New York (mea) In the first of a series of lecture presentations, eye-witness reports and workshops, the Clarence artist and language teacher Vivian Mauro spoke to an interested audience at the Clarence Town Library about her recent extended stay in Brazil. As happens to many of us during our lifetimes, at a certain point in her life Vivian's life came crashing down, and she found herself abandoned, without friends and family to give her support, exhausted and in a deteriorated health situation. I realized I was at the bottom with my life, with no hope for a better future. That is the time when one gets on the knees and turns to prayer". Then an opportunity appeared, out of nowhere. Vivian, who spent many years teaching English abroad and who is also a photographer, found out about a faith healer in Brazil. This seemed a special, even if unlikely chance to find a cure for her physical and spiritual health. 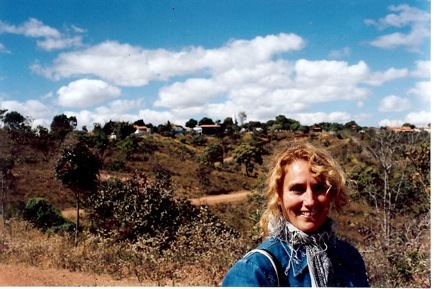 So, she packed her camera and went to visit the healing place not far from Brazilia, the capital of South America's largest and most populous country. Her planned two week stay with the healer turned to a year, and in the meantime, Vivian found a new viewpoint on life, spirituality and regained her health. Now she has returned to the Buffalo area and plans to re-establish her life here. She plans to arrange an exhibition of her photographs at the Museum of European Art in Clarence, continues to teach and as the official guide for the spiritual center in Brazil, she plans to take from time to time small groups for a two-week stay at the Casa de Dom Inacio (The House of St. Ignazius), where the Miracle Man' Joao Teixeira da Fara -- popularly known as John of God' -- has provided healing to more than 11 million of people over the last 35 years. In the upcoming presentations and group meditations, Vivian Mauro will share in more detail her knowledge about this special place, and make available more information about this remarkable healer, as well as practical information about making a trip to Brazil for those in need. The Brazilian Miracle Man' Joao Teixeira da Fara -- popularly known as John of God' -- has provided healing to more than 11 million of people over the last 35 years. The view from the spiritual healing center into the surrounding Brazilian countryside. Peole come here from all over the world for the miraculous healings throgh its founder, John of God.